When it rains, it pours ... vegetables. After considerable effort and investment to get our vege patch up to scratch, it is now paying us back with mountains of zucchini (courgette), cucumbers, peas, beans, lettuce, carrots and is just now delivering the first tomatoes. The kids love picking and snacking on snow peas and raspberries straight from the garden and are even taken with the novelty of eating raw carrot with the big bushy tops still attached. The zucchini plants have been ridiculously prolific and despite my best efforts to pick them (and give them away), occasionally a few sneak through and go gangbusters. These three enormous marrows are the result of our week away on holiday. 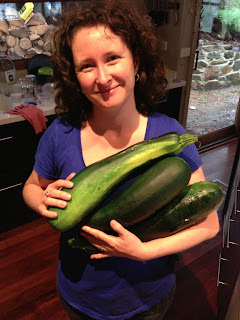 No idea what I'm going to do with them but as the family is well sick of zucchini, I think I'll have to hide them in muffins and loaves and fritters.